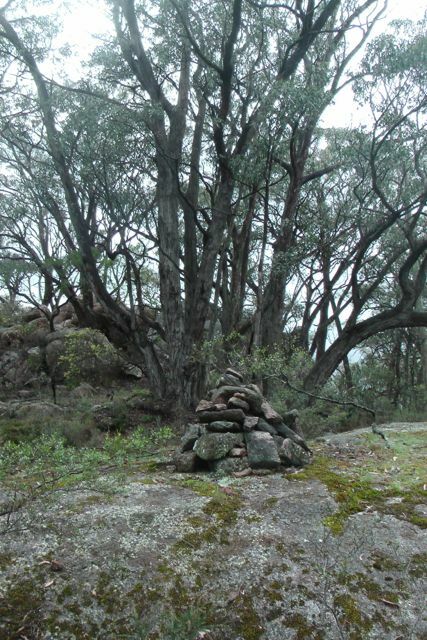 Mount Langi Ghiran, VK3/ VS-004 was my first summit activation for Tuesday 10th September, 2013. 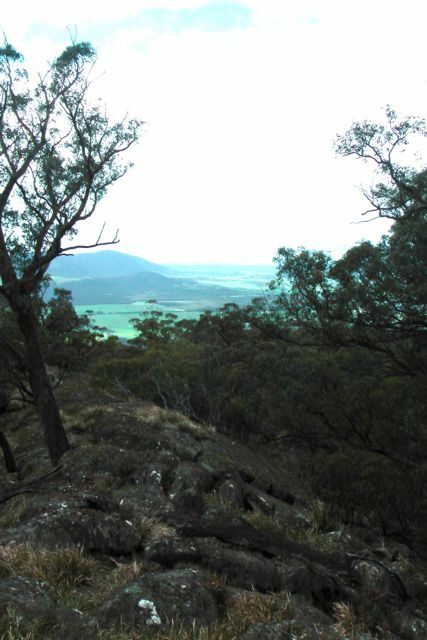 Mt Langi Ghiran is 950 metres ASL and is worth 6 SOTA points. 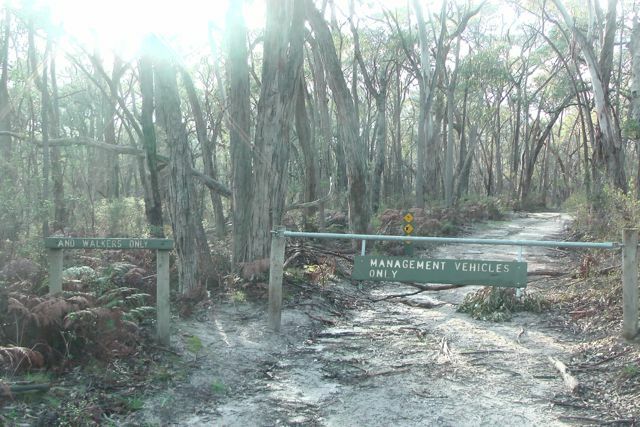 It is situated within the Langi Ghiran State Park, about 15 km east of Ararat, and about 220 km west of Melbourne. 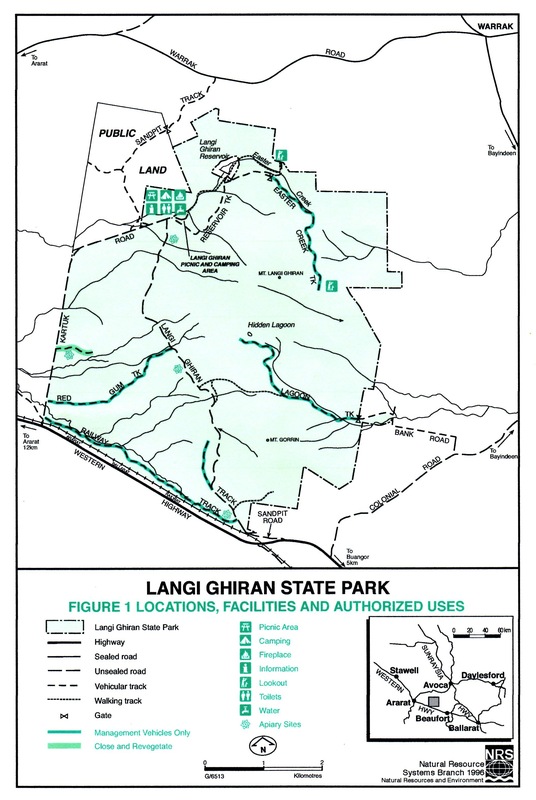 The Langi Ghiran State Park is 2,695 hectares in size and takes in Mount Langi Ghiran in the north, Mount Gorrin in the south, and a River Red Gum-Yellow Box open woodland in the west. The park, which was proclaimed in June 1987, has a rich Aboriginal cultural heritage and contains a wide range of significant Aboriginal archaelogical sites. Within the park is the historic Langi Ghiran Reservoir, which is still used as a supplementary water supply for Ararat. The park contains a variety of vegetation once typical of the area, including a number of significant species. The park has rugged granite peaks and attractive landscapes. The park supports a large amount of wildlife, including the rare Squirrel Glider, and Brush-tailed Phascogale. The introduced Sambar deer are also found in the park. Over 105 species of birds have been recorded in the park, including the rare species Painted Honeyeater, Powerful Owl, and Black Falcon. There are also numerous reptiles including the Marbled Gecko, Large Striped Skink, Bougainville’s Skink, and Shingeback. I entered the park via the Western Highway and drove along Kartuk Road, which is on the western border of the park. 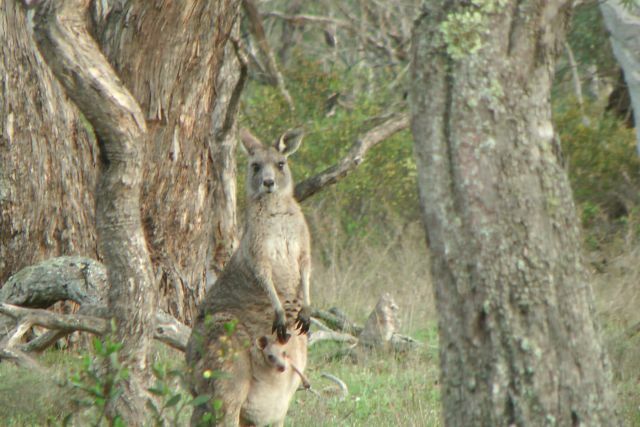 I had only driven a very short distance and I saw the first group of Western Grey kangaroos. Travelling down the track took a bit of time because there were kangaroos everywhere, and they were not adverse to jumping out in front of the car. 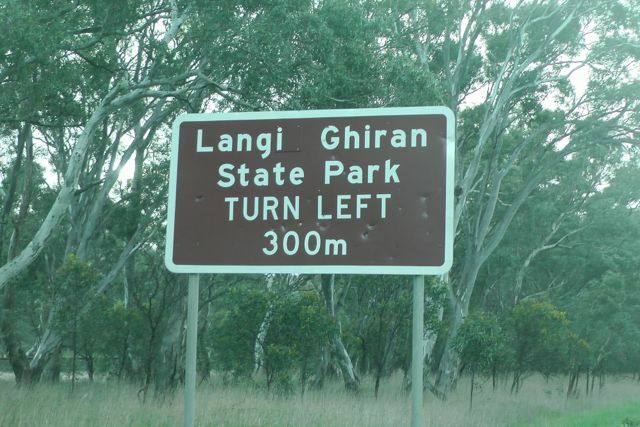 Kartuk Road leads to the Langi Ghiran camping & picnic ground. 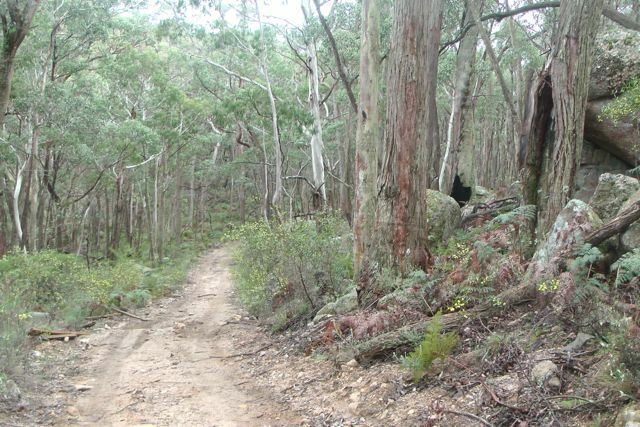 Just before you enter the picnic ground area, there is a track running off to the right called Reservoir Track, which is a dirt track that leads to the Langi Ghiran Reservoir. I drove out along Reservoir Track and stopped at the historic reservoir for a quick look. I then continued on towards the summit, driving along Easter Track. After a short distance I reached a locked gate with two signs which read ‘Management Vehicles Only” and “And Walkers only”. I parked the car here and commenced walking up Easter Track towards the summit. It is about a 3km walk from here. Easter Track starts off with a gentle gradient and good surface. But as you get closer to the summit, the track roughens up and the gradient gets much steeper. Eventually I reached a small cairn built of moss rocks on the left hand side of the track. From here I saw a small track on the right, which was quite grown over. It led off into the scrub on the western side of the track and heads off to the summit. The track soon disappeared amongst the scrub and I had to trek through thick scrub and scramble over large moss rocks, until I reached the summit. 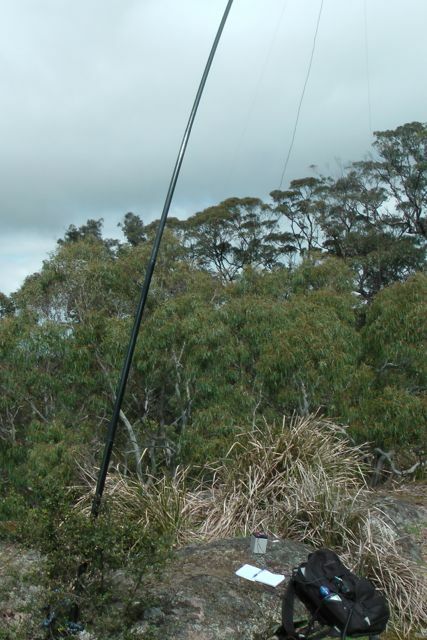 I set up my 40m/20m linked pole in an inverted vee configuration, using my 7 m squid pole, which I secured with octopus straps to a small shrub growing amongst the rocks. I tuned to 40m and put out a call. Things started off extremely slow. My first 4 qualifying QSO’s with Peter VK3PF, Charles VK5FBAC, Brian VK5FMID, and Peter VK3FPSR mobile, took a long time to achieve. But following that, things really picked up, and conditions seemed very good on 40m. After about half an hour on the summit, I spoke with Ed VK2JI who advised that Andrew VK2ONZ was due to come up on a summit within the next 30 minutes. Sure enough I checked the iphone and the SOTA Goat application, and I saw that Andrew was due to be on a VK2 summit by 0100 UTC. So I decided to stay on the summit longer than planned, hoping that I could get a ‘Summit to Summit’ into New South Wales. But unfortunately Andrew didn’t come up, so I decided it was time to head down. I had a 3km walk back to the car and I still had another SOTA activation planned, along with a National Park. After a very slow start I had 42 QSO’s in the notebook on 40m SSB. Peter VK3PF; Charles VK5FBAC; Brian VK5FMID; Peter VK3FPSR/m; Jim VK5JW; Ed VK2JI; Rhett VK3GHZ/m; Ivan VK5HS; John VK5BJE/p; Larry VK5LY; Bruce VK3FBNG; John VK5PO; Colin VK3UBY; Ron VK3AFW; Peter VK1XP; Andrew VK3ARR/qrp; Brian VK3MCD/qrp; John VK5SIX; and VK3EMU. VK3EMU; Peter VK3PF/qrp; Fred VK3JM/qrp; Brian VK3MCD/qrp; Andrew VK3ARR/qrp; Dale VK5FSCK; Peter VK3FPSR; Brian VK5FMID; Larry VK5LY; Peter VK1XP; Colin VK3UBY; Ed VK2JI; John VK5BJE/p; Phil VK2CPO/qrp; Ron VK3AFW/m; Tony VK3CAT; Bernard VK3AMB; Ron VK3MRH; John VK5BJE/p; Tony VK5ZAI; Graham VK5KGP; Michelle VK3FEAT/p; and David VK5KC. I have posted a video of the activation on You Tube….. This was a very enjoyable walk. Not too taxing. Took about 90 minutes, but was well worth getting to the top. I appreciate you giving me a call.